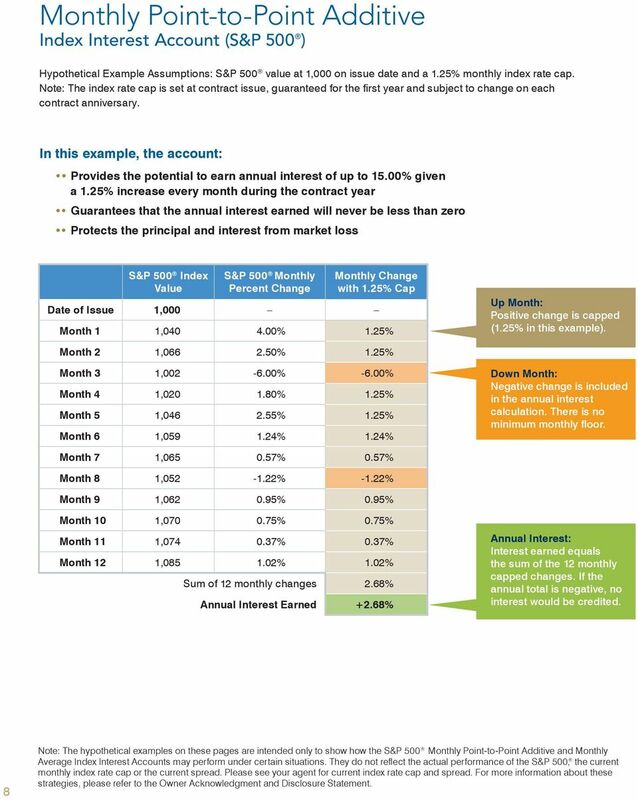 Download "A Powerful Combination for Retirement"
10 Monthly Point-to-Point Additive Index Interest Account (S&P 500 ) Hypothetical Example Assumptions: S&P 500 value at 1,000 on issue date and a 1.25% monthly index rate cap. 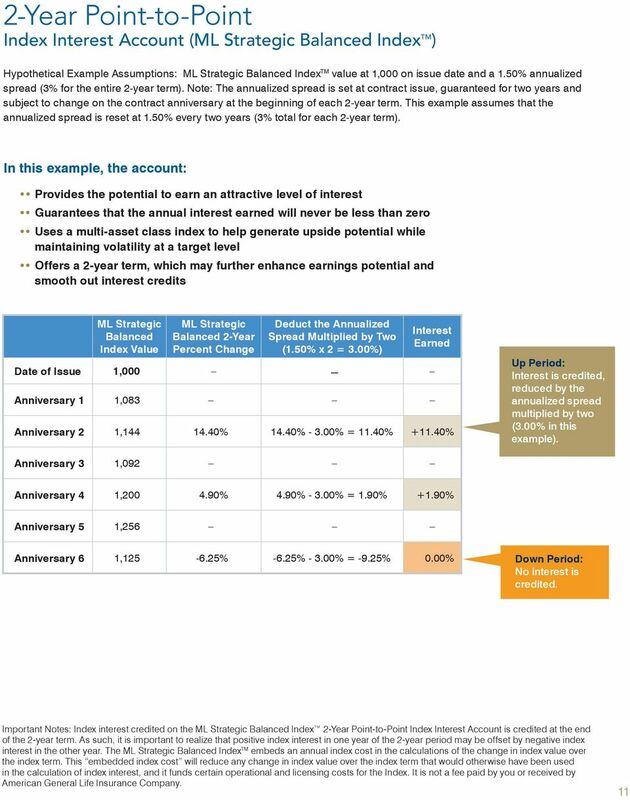 Note: The index rate cap is set at contract issue, guaranteed for the first year and subject to change on each contract anniversary. 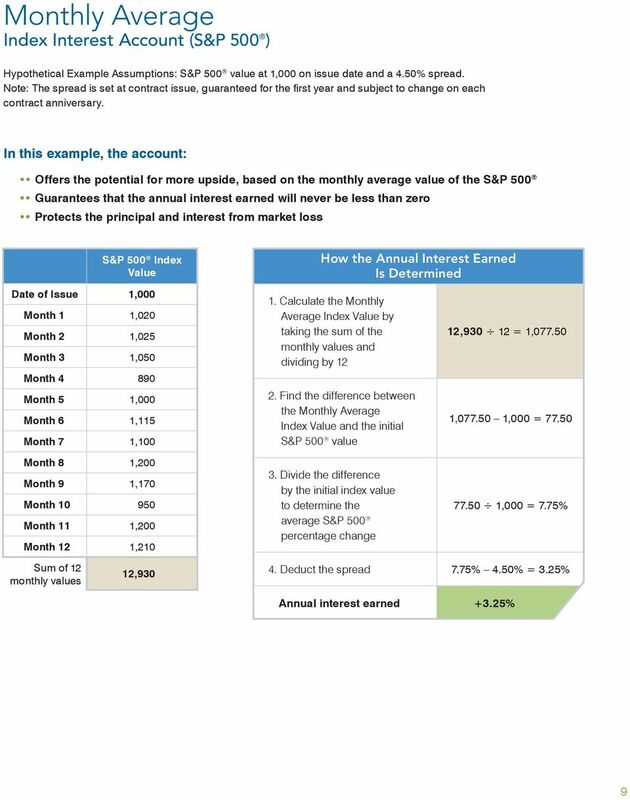 In this example, the account: Provides the potential to earn annual interest of up to 15.00% given a 1.25% increase every month during the contract year Guarantees that the annual interest earned will never be less than zero Protects the principal and interest from market loss S&P 500 Index Value S&P 500 Monthly Percent Change Monthly Change with 1.25% Cap Date of Issue 1,000 Month 1 1, % 1.25% Up Month: Positive change is capped (1.25% in this example). Month 2 1, % 1.25% Month 3 1, % -6.00% Month 4 1, % 1.25% Month 5 1, % 1.25% Month 6 1, % 1.24% Down Month: Negative change is included in the annual interest calculation. There is no minimum monthly floor. Month 7 1, % 0.57% Month 8 1, % -1.22% Month 9 1, % 0.95% Month 10 1, % 0.75% Month 11 1, % 0.37% Month 12 1, % 1.02% Sum of 12 monthly changes 2.68% Annual Interest Earned +2.68% Annual Interest: Interest earned equals the sum of the 12 monthly capped changes. If the annual total is negative, no interest would be credited. 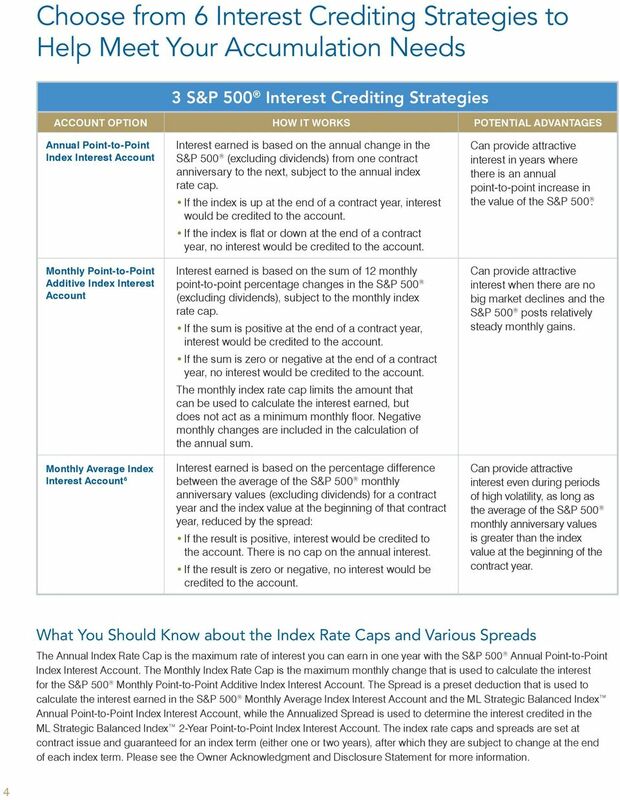 8 Note: The hypothetical examples on these pages are intended only to show how the S&P 500 Monthly Point-to-Point Additive and Monthly Average Index Interest Accounts may perform under certain situations. They do not reflect the actual performance of the S&P 500, the current monthly index rate cap or the current spread. Please see your agent for current index rate cap and spread. For more information about these strategies, please refer to the Owner Acknowledgment and Disclosure Statement. 12 Annual Point-to-Point Index Interest Account (ML Strategic Balanced Index TM ) Hypothetical Example Assumptions: ML Strategic Balanced Index TM value at 1,000 on issue date and a 3.50% spread. Note: The spread is set at contract issue, guaranteed for the first year and subject to change on each contract anniversary. This example assumes that the spread is reset at 3.50% every year. 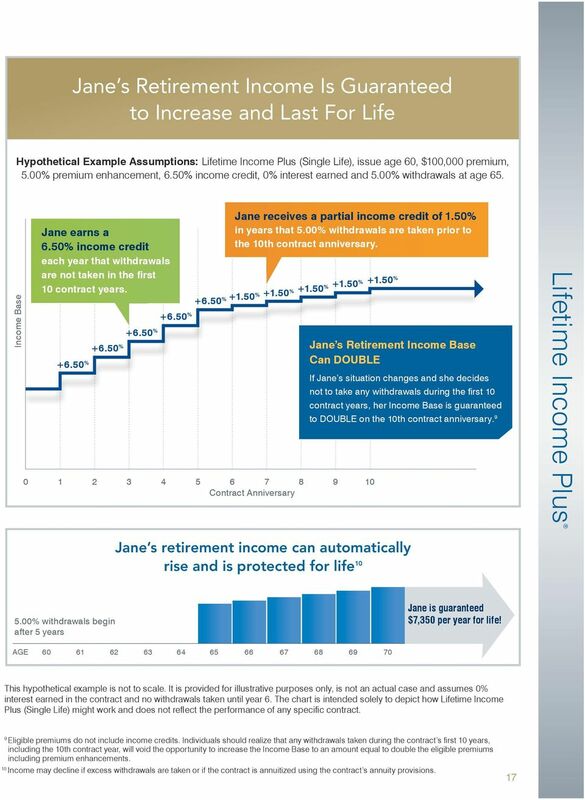 In this example, the account: Provides the potential to earn an attractive level of interest Guarantees that the annual interest earned will never be less than zero Uses a multi-asset class index to help generate upside potential while maintaining volatility at a target level ML Strategic Balanced Index Value ML Strategic Balanced Annual Percent Change Deduct the Spread Annual Interest Earned Date of Issue 1,000 Anniversary 1 1, % 8.30% % = 4.80% +4.80% Up Year: Interest is credited, reduced by the spread (3.50% in this example). Anniversary 2 1, % 5.63% % = 2.13% +2.13% Anniversary 3 1, % -4.55% % = -8.05% +0.00% Anniversary 4 1, % 9.89% % = 6.39% +6.39% Anniversary 5 1, % 4.67% % = 1.17% +1.17% Anniversary 6 1, % % % = % +0.00% Down Year: No interest is credited. 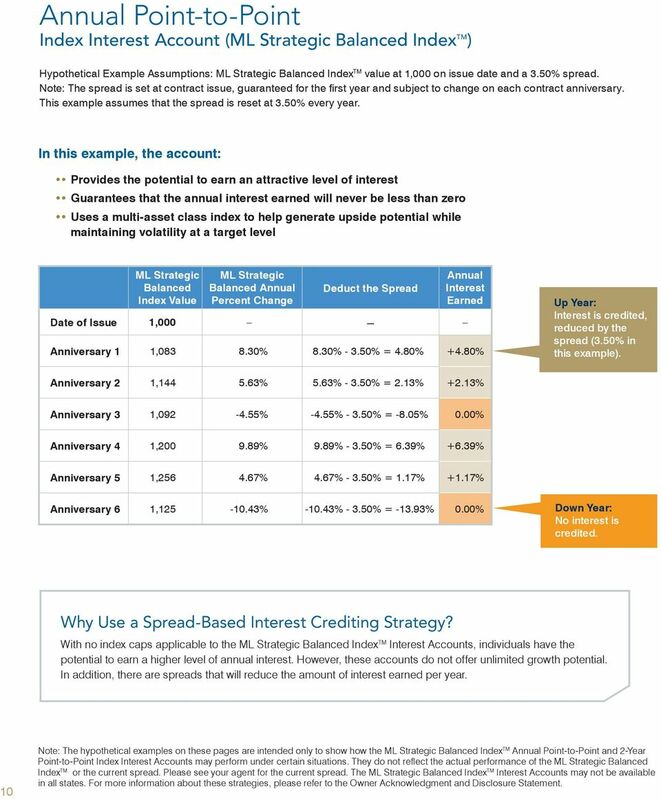 Why Use a Spread-Based Interest Crediting Strategy? 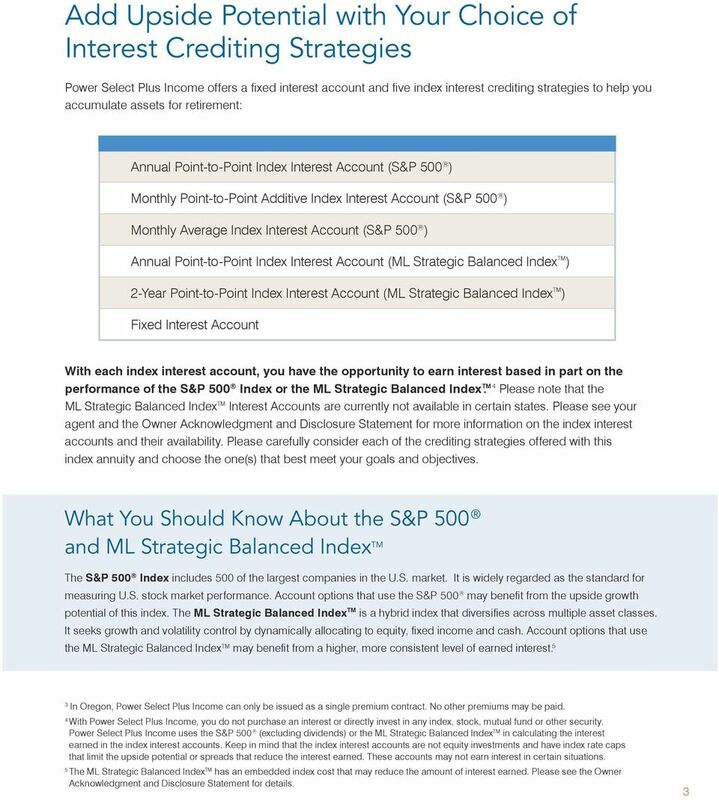 With no index caps applicable to the ML Strategic Balanced Index TM Interest Accounts, individuals have the potential to earn a higher level of annual interest. However, these accounts do not offer unlimited growth potential. 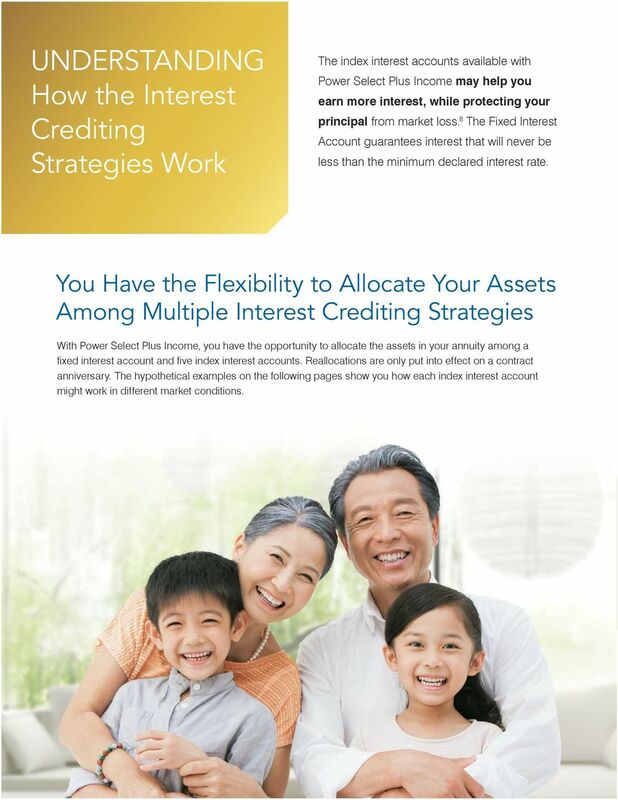 In addition, there are spreads that will reduce the amount of interest earned per year. 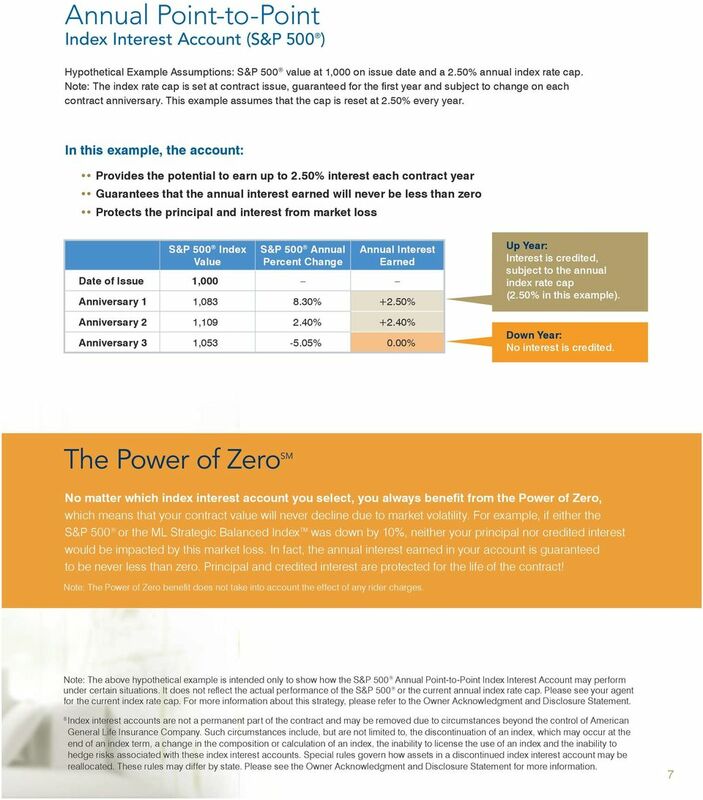 10 Note: The hypothetical examples on these pages are intended only to show how the ML Strategic Balanced Index TM Annual Point-to-Point and 2-Year Point-to-Point Index Interest Accounts may perform under certain situations. They do not reflect the actual performance of the ML Strategic Balanced Index TM or the current spread. Please see your agent for the current spread. 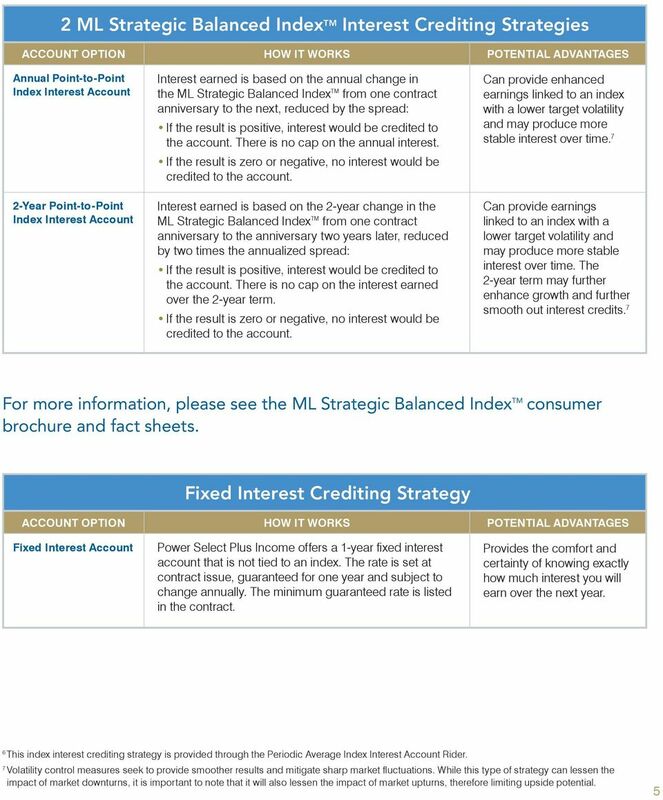 The ML Strategic Balanced Index TM Interest Accounts may not be available in all states. For more information about these strategies, please refer to the Owner Acknowledgment and Disclosure Statement. 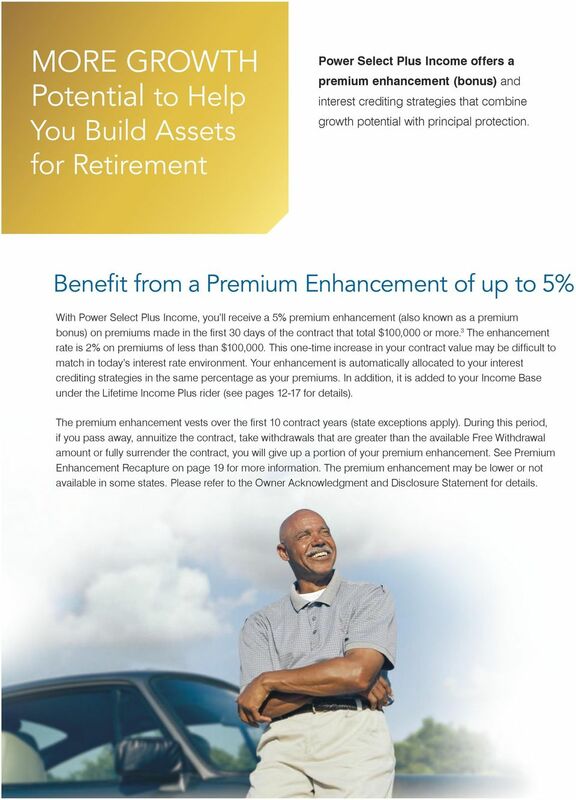 GROW more assets for retirement with interest crediting strategies that are based in part on the performance of the S&P 500 (excluding dividends). 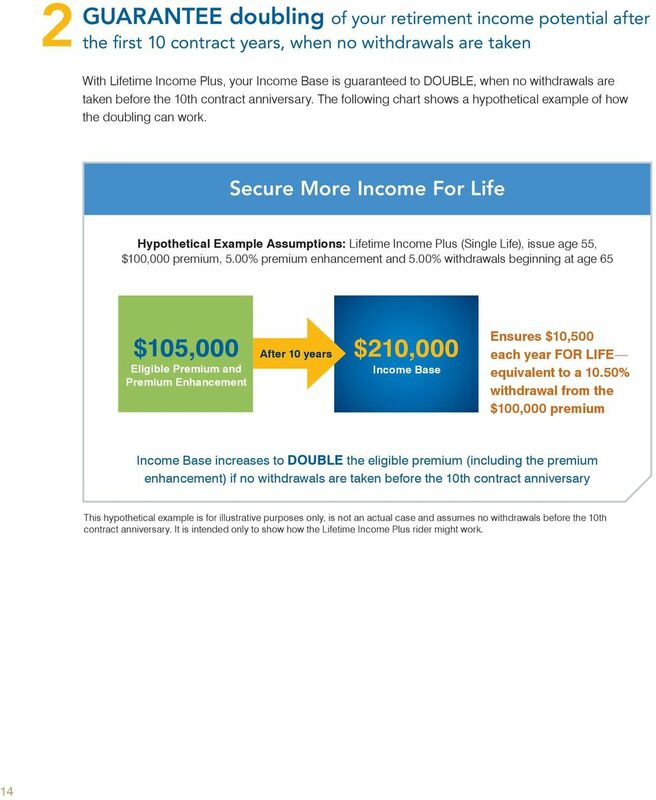 Allianz Life Insurance Company of North America Allianz MasterDex 5 SM Plus Annuity Make your plans. Then make them happen. 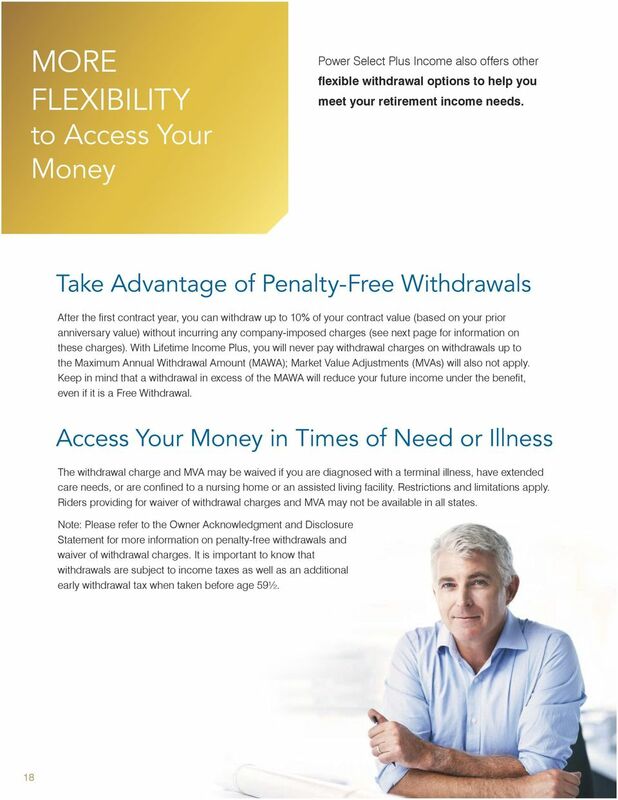 CB51261-3 Page 1 of 16 Discover the MasterDex 5 Plus SM Annuity from Allianz. 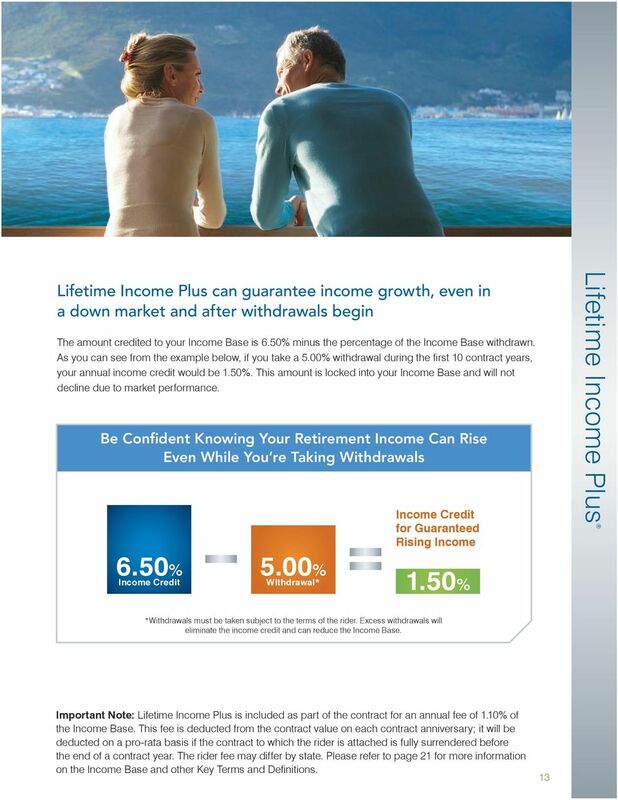 Allianz Life Insurance Company of North America Allianz MasterDex 5 Plus SM Annuity Make your plans. Then make them happen. CB51261-2 Page 1 of 16 A fixed index annuity from Allianz can be a valuable asset. 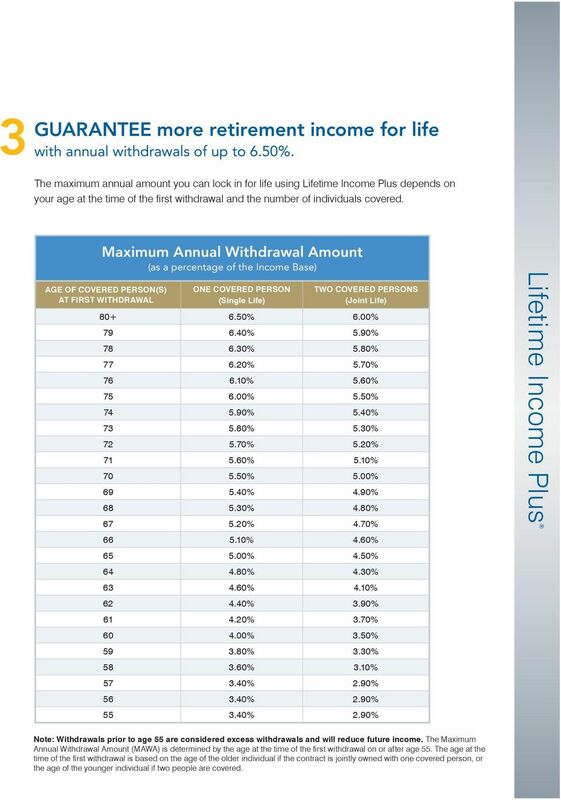 Build your retirement plan to last a lifetime. 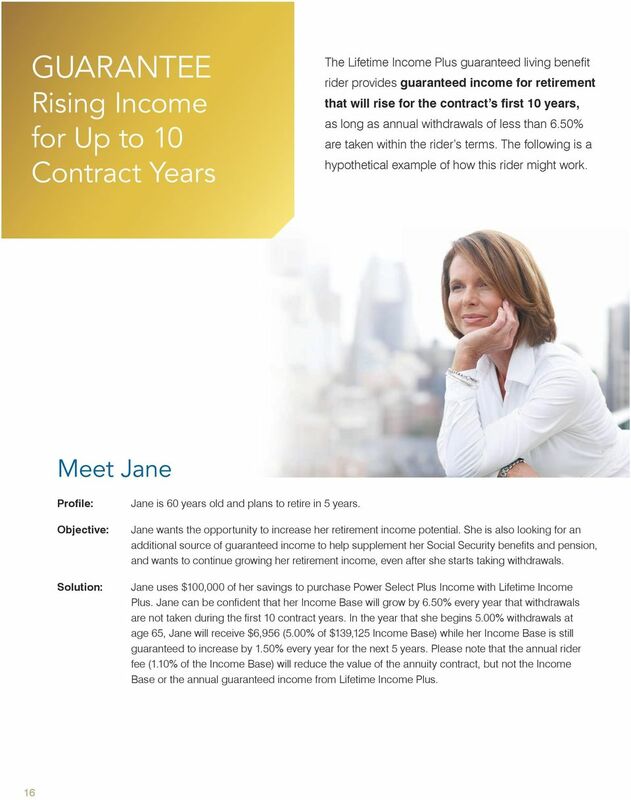 or guarantee rising income for up to 12 years? 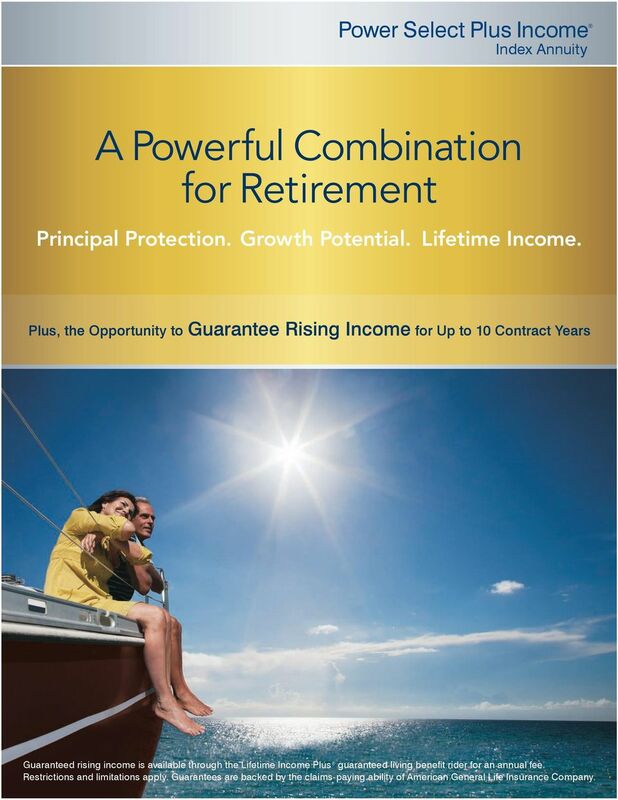 BUYER'S GUIDE TO EQUITY-INDEXED ANNUITIES WHAT ARE THE DIFFERENT KINDS OF ANNUITY CONTRACTS? 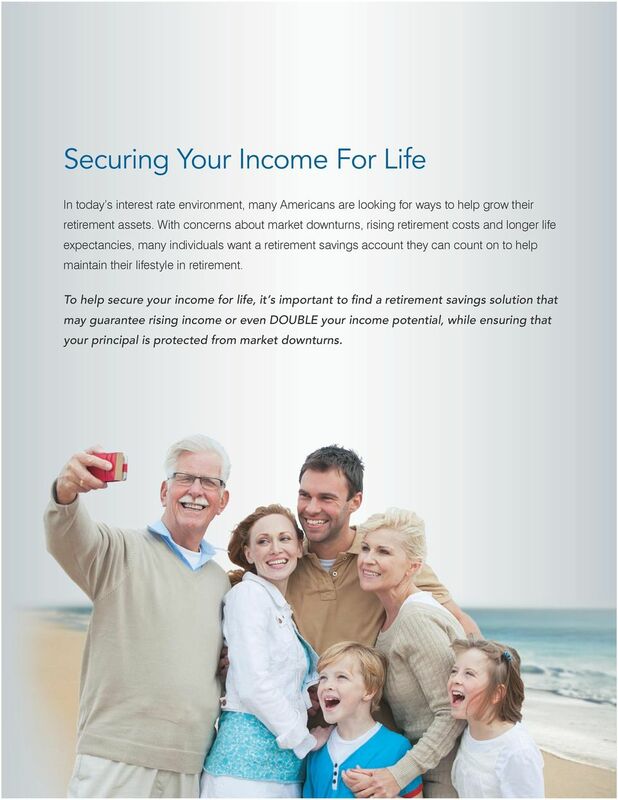 CLIENT BROCHURE Nationwide YourLife Indexed UL Find balance in life Planning for the future may seem stressful these days especially with so much market uncertainty. But it doesn t have to be that way. B1096013NW. Safe Return. 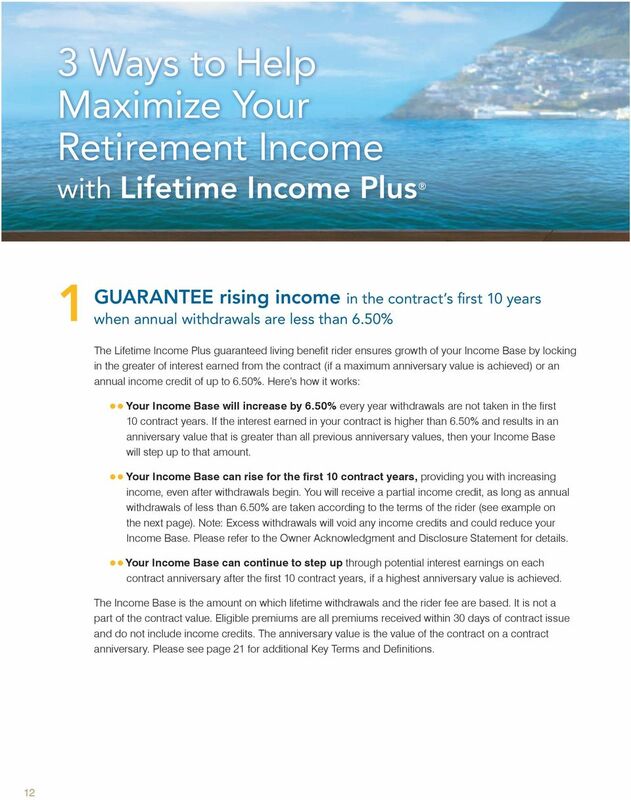 a fixed-indexed annuity from Great American Life Insurance Company, a subsidiary of Great American Financial Resources, Inc.
Security Benefit Secure Income Annuity Statement of Understanding Effective Date: June 16, 2014 Must be signed by the customer and agent and the signature page returned to Security Benefi t with the application. The Security Benefit Foundations Annuity Frequently Asked Questions This document is intended to assist consumers with the Foundations Annuity by providing additional guidance on the product and its features. 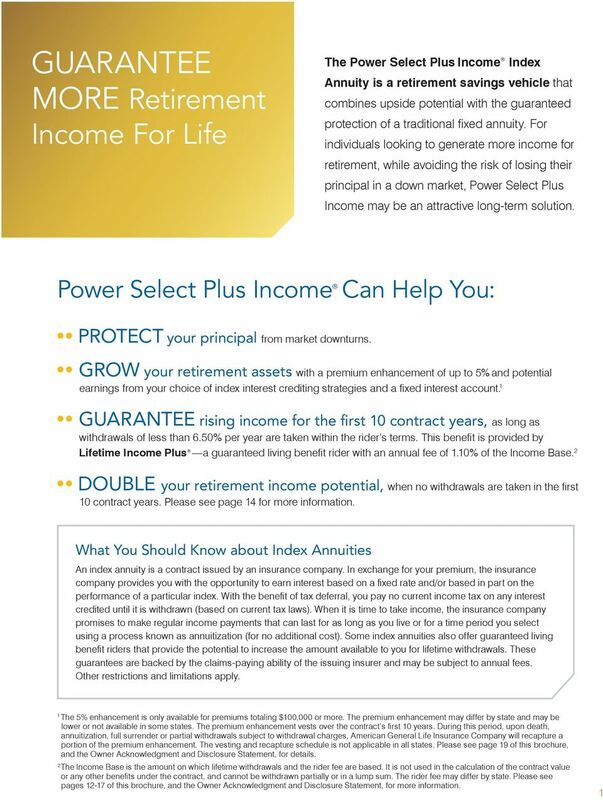 Protective Indexed Annuity Fixed Indexed Annuity Profile PAC.4939 PAC.xxxx (12.12) (04.13) Protective Life annuities are designed specifically to help you more effectively prepare for and experience retirement.